What are the latest trends in the flooring world? While we're still seeing many of our favorite time-tested materials in play, colors, patterns, sizes and textures are reaching new heights. Read on for our favorite trends and applications for hardwood, tile, vinyl and carpet. As is particularly the case in Colorado, hardwood floors continue to be the most popular option for many homes' main living areas. Hardwood (especially real, site finished wood like we use!) wears beautifully over time and provides both a feeling and look of warmth. We've seen color preferences swing from dark to light and back again; today's focus is on a color that provides a solid foundation for the rest of your style. We are loving the return of warm tones in particular; the latest of which play beautifully with both cream and gray palates. For an incredibly durable yet beautiful option for bathrooms, laundry rooms and beyond, tile continues to be a strong trend. We're seeing large-format options continue to gain traction, with tile for residential use reaching sizes we didn't imagine! The once-surprising 12"x24" tile trend has grown to 24"x48" and 6"x24" plank tiles are giving hardwood some good competition. An equally-popular trend is found with retro patterns reinvented for today; herringbone, hexagonal and penny rounds are making a comeback in a big way. If the word "vinyl" conjures up images of Grandma's guest bathroom, you won't believe your eyes with the new luxury vinyl options. Vinyl is warm and soft underfoot and incredibly practical (say goodbye to grout). 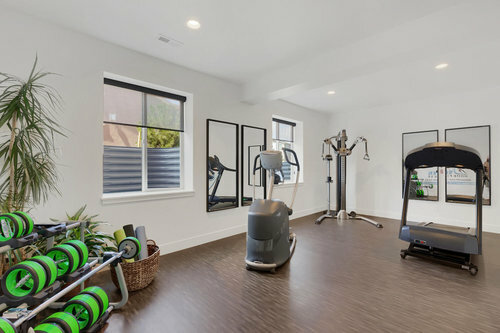 We love it in home gyms, laundry rooms and bathrooms, in particular. The variety of colors, patterns and styles is incredible. Frieze and shag carpets are making way for "cut and loop" styles, which offer both pattern and texture. Similarly short and dense carpets used to feel "tight" underfoot; now the mix of cut and looped (hence the name) fibers ensure a soft feel that holds up in highly trafficked pathways. It's hard to beat a plush carpet when stepping out of bed in the morning! We love the funky new modern patterns and colorways, in particular, but are ever fond of traditional styles like shown above, as well.